The US Federal Aviation Administration (FAA) is investigating an apparent near-miss involving an Air Canada flight at San Francisco's airport. 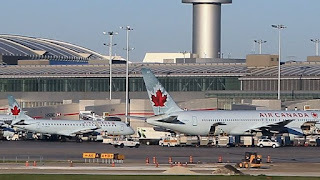 It says Flight AC759 from Toronto was cleared to land on a runway last Friday, but the pilot "inadvertently" lined up for a taxiway where four aircraft were waiting to depart. An air traffic controller became aware of the problem and ordered the pilot to pull up and make another approach. The Airbus 320 then landed safely. The FAA is currently investigating the distance between the Air Canada aircraft and the aircraft lined up on the taxiway, which runs parallel to the runway. It was not immediately clear how many people were aboard the flight from Toronto, or in the four planes on the taxiway. Air Canada is also investigating the incident, a spokesman for the company says. "Air Canada flight AC759 from Toronto was preparing to land at San Francisco airport Friday night when the aircraft initiated a go-around," Peter Fitzpatrick is quoted as saying by CBC News. "The aircraft landed normally without incident. We are still investigating the circumstances and therefore have no additional information to offer." Meanwhile, an audio recording has emerged of what are said to be last Friday's communications between air traffic controllers and pilots at San Francisco's airport. A pilot from one of the planes on the ground is then heard saying: "United One, Air Canada flew directly over us." "If it is true, what happened probably came close to the greatest aviation disaster in history," retired United Airlines Capt Ross Aimer, CEO of Aero Consulting Experts, told the Mercury News. "If you could imagine an Airbus colliding with four passenger aircraft wide bodies, full of fuel and passengers, then you can imagine how horrific this could have been," he said.